I'm about to head out on vacation (!) but I wanted to post this before I left; it's kind of an old school, pen and ink drawing of a figure standing before a creepy castle (like the stuff I used to doodle all the time in middle school). It was really fun to just play and do a drawing like this, though it did chew up about half a micron pen... enjoy! Nice. 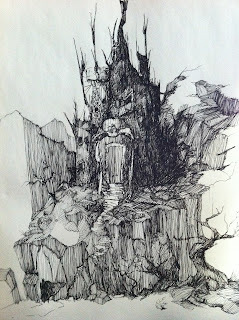 If they make another "Scary Stories to Tell in the Dark" book ever, you should be the illustrator.